Now, I want you to know that I have been a CEO, a full-time chef, an entrepreneur, an Emmy-winning television personality and an expert at slow cooking (my book Martha Stewart’s Slow Cooker was published in 2017). 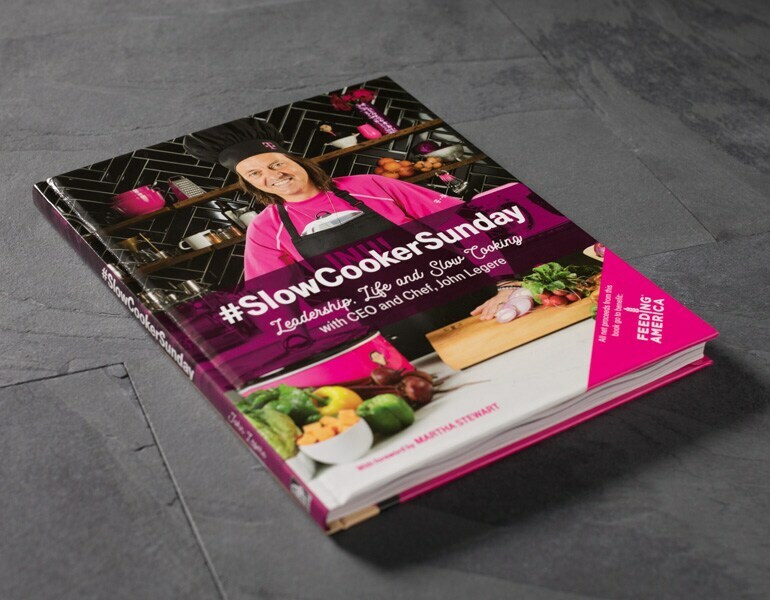 I am feeling a bit competitive with John Legere since he has followed a similar path and has just written this book, #SlowCookerSunday. I have gone through this book with a fine-tooth comb and must admit that it’s pretty good! I like it because it’s more than just a book full of great recipes for cooking. It’s also a primer for all of us who want some great advice on how to be a great CEO and a successful entrepreneur. John is known in the business world as an unconventional leader, and reading his bold quotes in the book belies that unconventionality and reveals a sensible, straight thinker who gets to the nitty gritty of business problems, listens and acts instead of vacillating and asks questions to get to the bottom of a challenging conundrum. All the while, by the way, cooking up a storm of delicious and creative and well-acknowledged recipes, demonstrating them on TV while wearing a magenta leisure suit in a black and magenta and silver monogrammed outfit with a black toque clearly marked CEO, never letting us forget that T-Mobile and slow cooking have gone hand in hand on his road to amazing success! We are also reminded that John takes chances. For heaven’s sake, he hired Snoop Dogg and me to star in a Super Bowl commercial for T-Mobile. We had so much fun re-living our partnership on our TV show, Martha and Snoop’s Potluck Dinner Party, making references, of course, to Snoop’s use of forbidden substances in his cooking, so lots of greens and cans of bisque while hugging purple cushions! I know Snoop, who just published his first cookbook, will use this book just as often as I will—because not only do we love John Legere and his business acumen, but also his “bon mots” about business! Maybe now that you have a book to promote, John, you’ll come on the next season of Potluck Dinner Party? Excerpted from #SlowCookerSunday — Leadership, Life and Slow Cooking with CEO and Chef, John Legere, available on T-Mobile.com Dec. 6 and in T-Mobile stores nationwide Dec. 7.